Woohoo! My Glossybox is here. My Glossybox is here. I wasn’t expecting it until tomorrow but the mailman just dropped it off on my desk this morning. YES! AND I was not expecting a full on palette. My mouth kind of dropped open. HAHA Glossybox got me! I Y this box this month. Okay the card says Mirror Polish but the bottle says Shimmer Delight. But this stuff does make your hair all nice, shiny and smooth. I applied it on freshly washed and styled hair and I could noticeably see a ‘healthy’ shine. Love. Soothing Hydrating Anti-aging lip balm with SPF20? Yes please! I have never tried B.Kamins products before but I have heard of them. And a Canadian company! How did Glossybox know I just ran out of deodorant? I go between Dove and Secret products. I have never tried the Cleartone yet. Not that I am really worried about my 'pits' getting discoloured or pocked from shaving. I say if someone is looking that close then they deserve the shock of a lifetime HAHA. I am not sure what the 5 units mean but I love supporting causes. Most of the time my charity dollars go to animal shelters/causes or Arthritis societies. 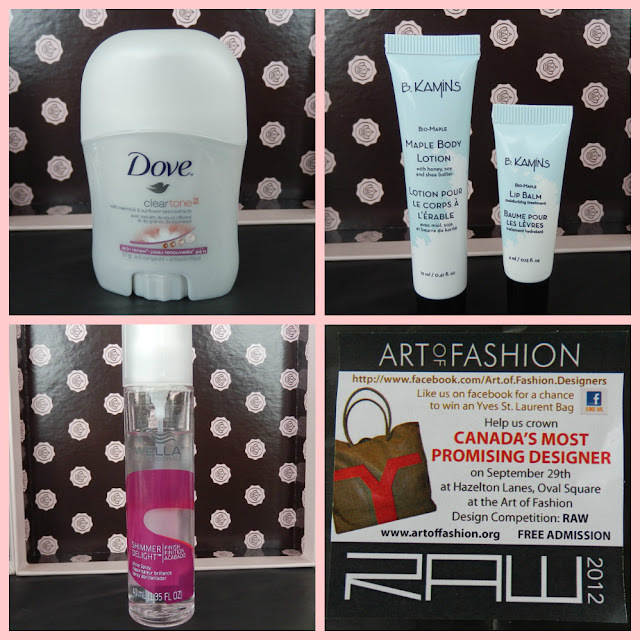 But I will be heading over to the Art of Fashion facebook page and check it out. Well holy poo, let me tell you I was shocked when I saw this. I have used and own various NYX products, mostly lip liners but I do not think I have ever actually tried their eyeshadows. This palette was inspired by the Johnny Depp movie Dark Shadows. Now I may be getting all gaga over nothing but it's a PALETTE, man… er.. ladies A PALETTE!! With everything you need for a red carpet look. It comes as a book palette with a snap closure. It has 24 eye shadows (a good mix), large mirror, eye shadow base, liquid eyeliner, 5 blushes, an illuminator, and 4 lip glosses. This is a packed little palette! Now you will see my product card also states the Wella Professional Mirror Polish Shine Serum but I did not receive one. We either got one or the other based on our profile. 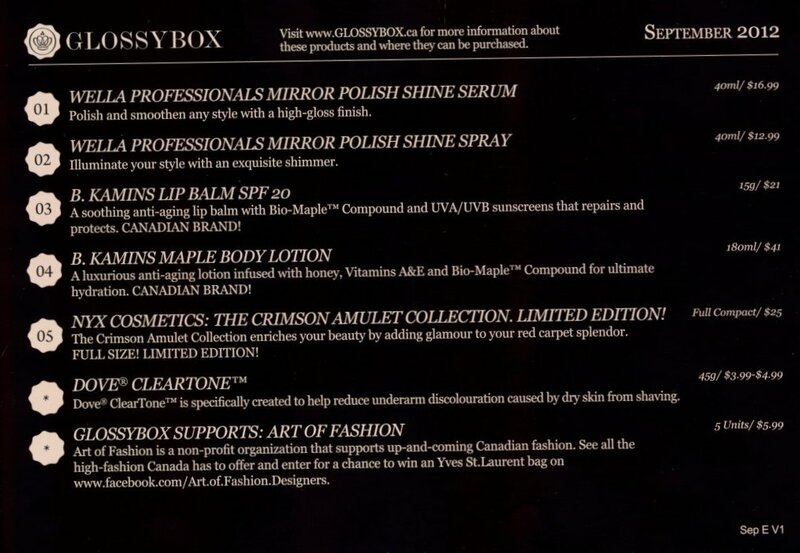 Also a reminder, first time subscribers to Glossybox.ca can use promo code GLOSSY27 at check out to save 10% ($1.50). A monthly subscription is $15. 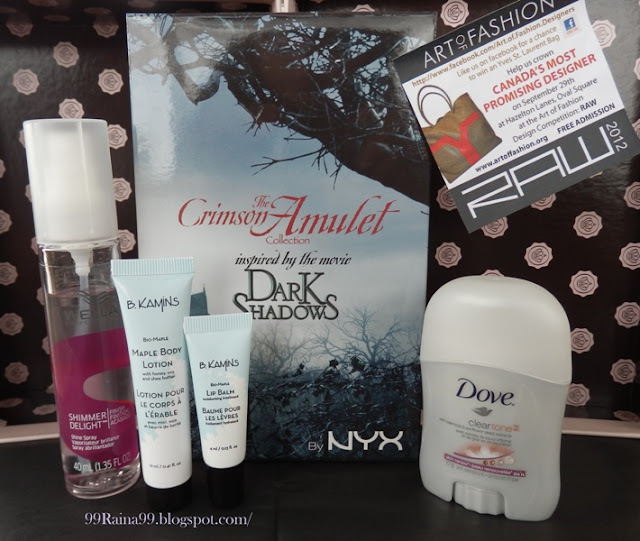 Anyhow, I am pretty happy with this month's Glossybox. See how excited I get when makeup shows up in our boxes? 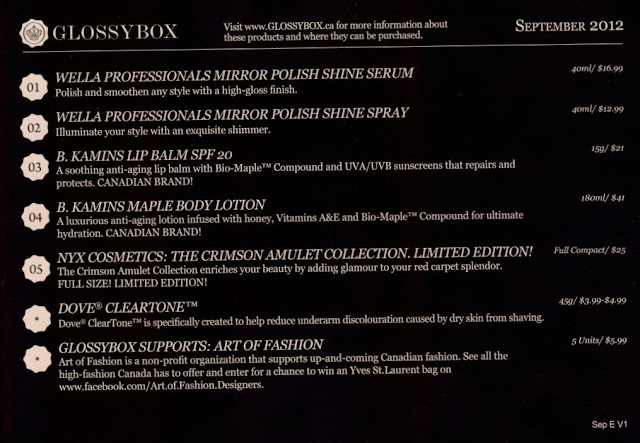 LOL What do you think about this month's Glossybox? I am so excited for mine to come in the mail now! Looks like a great box this month, just hope mine will be as good as yours. I think the only real diffrence will be the Sebastian spray or serum. But I hope everyone gets the palette! That would stink if they didn't! Ooops I meant Wela not Sebastian -my bad. I'll be disapointed if I dont have it! I wasn't too excited when i opened it, because the B.Kamins samples i received on a plane ride about a year back, so I have already tried it, and as for the palette, I just bought one at a local London Drugs for i believe 12 dollars.. It was a little disappointing. Aww that's too bad Katya! Maybe you can gift the palette to a friend or family? I am sure it would make their day. How did you like the palette overall? Noooo! I can't believe I already bought the palette!!!! Awww, thank you!! Yeah, I'm sure SOMEONE will want my palette because it seems like overkill for me to have two. So, we weren't supposed to get both of the Wella items? Just one or the other? Yeah, I saw it on their Facebook page. Others were wondering why they only got one Wella product. Glossybox said they put all the product info on one card this month. I hope you do a FOTD with it :) I would love that. AHHH - such a fantastic box! I saw this palette at a store awhile ago and was SO tempted to get it, I'm so glad I didn't since I may get one in my Glossybox!!! Good thing you waited! I believe everyone is getting the palette. What a beautiful box! I loved it! I am happy everyone got one! LOL that must have been an amazing stack of palettes at Glossybox HQ!